Scapulothoracic dissociation refers to complete separation of the scapula and the upper extremity from the thoracic attachments. It was defined as a complete disruption of the scapulothoracic articulation with lateral scapular displacement and intact skin by Oereck in 1984 who is credited with its first report. It is also called traumatic forequarter amputation with intact skin. It is a rare injury with potentially debilitating consequences. This severe injury is often associated with a wide range of musculoskeletal, neurovascular injuries and injuries to other systems such as head injury, chest injury, and abdominal injury. Besides the lateral displacement of the scapula, there are major injuries to the shoulder girdle, including the deltoid, pectoralis minor, rhomboid, levator scapulae, trapezius, and latisimus dorsi muscles, the subclavian and/or axillary arteries and veins brachial plexus injuries. Soft-tissue swelling of the shoulder, lateral displacement of the scapula, acromioclavicular separation, a displaced clavicular fracture, or a sternoclavicular disruption) and neurovascular injuries have been found to be associated. Often the injury is unilateral but bilateral cases of scapulothoracic dissociation have been reported rarely. About half of the reported cases involve motorcycle accidents. Often the rider is thrown off the bike but reflexively hold onto the handlebar, leading to a distraction/sheer force strong enough to dislocate the acromioclavicular joint or tear the shoulder girdle musculature. Scapulothoracic dissociation is characteristically associated with poor outcomes. Moreover, because the injury is closed and there is often vascular disruption with potential for exsanguination, this is a potentially life-threatening injury. But it can still be missed because of the presence of often severe concomitant injuries. For the same reason [high mortality rate], scapulothoracic dissociation may be underreported. Therefore, the injury requires a high index of suspicion, early diagnosis followed by emergency management. Scapulothoracic joint is a sliding joint that articulates with ribs 2-7 along with upper limb to aid upper limb movements. The scapula bone articulates with clavicle at acromioclavicular joint and with hermit at glenohumeral joint. 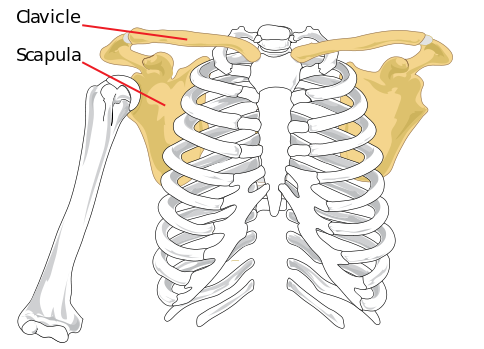 Thus the only attachment of the scapula with the axial skeleton is through the acromioclavicular joint. It is a kind of weak connection, though it is enforced and stabilized with strong muscles. There is no bony articulation with the thorax. The movements of sliding are maintained by muscles. 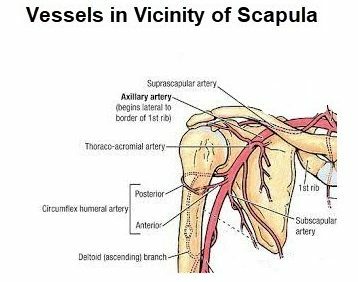 Brachial plexus, subclavian artery, and axillary artery are in the vicinity and thus prone to injury when scapula is pulled. There would be a history of high energy trauma. In case of concomitant head injury, the patient may be unconscious. In conscious patients, there would be a complaint of pain and swelling in the shoulder region. The patient may also complain of numbness/tingling in involved upper extremity. The examination would reveal large swelling and significant bruising in the shoulder region. Pulses may be decreased or absent and there would be a neural deficit on examination. Musculoskeletal injury with a neurologic and vascular injury. Musculoskeletal injury with complete brachial plexus avulsion. Diagnosis can be made with an anterior-posterior chest radiograph. Scapulothoracic dissociation is marked by lateral displacement of the scapula. The edge of the scapula is displaced > 1 cm from the spinous process as compared to the contralateral side. The degree of lateralization can be quantified using the scapula-index which is calculated by measuring the distance from vertebral spinous processes to the medial border of the scapula bilaterally and dividing the value of the injured side by the value on the non-injured side. The average scapula index is 1.07 +/- 0.04. 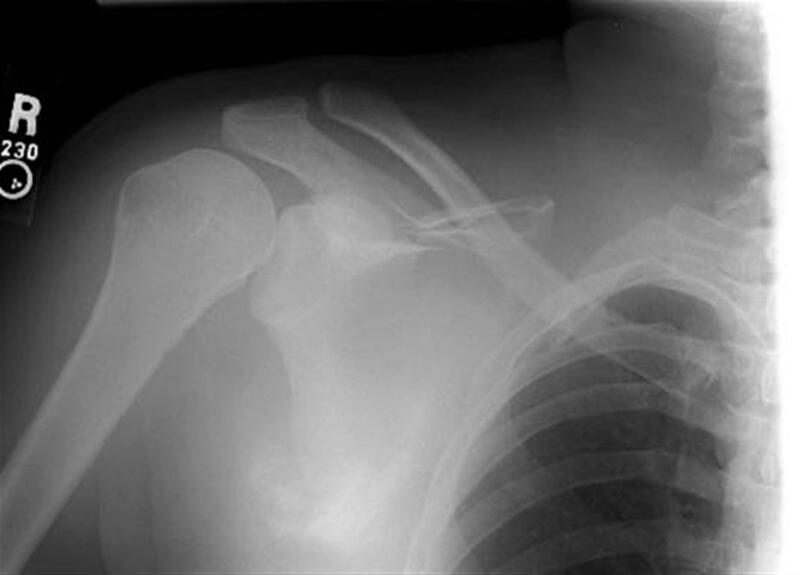 Widely displaced clavicle fracture, acromioclavicular separation, and sternoclavicular dislocation could be other injuries noticeable on this x-ray. Angiogram is indicated to detect injury to subclavian and axillary artery especially if the patient has a pulseless upper extremity. The initial management will focus on more serious injuries, cardiopulmonary resuscitation, and stabilization of the patient. The scapulothoracic dissociation injury should be evaluated and if there are vascular injury and ischemic complications, it becomes an orthopedics emergency as well. Repair [preferably within 4-6 hours of injury. 24 hours to 2 weeks after the injury, focuses on management of the sequelae of the initial injury and consideration for amputation. If a complete injury to the brachial plexus exists, a patient may benefit from glenohumeral disarticulation or above-elbow amputation. The final phase evaluates nerve injury and considers reconstruction options. Amputation should be considered for patients where functional recovery is unlikely. The outcome is often poor, often due to other associated injuries. About 10% of patients with scapulothoracic dissociation die from their concomitant traumatic injuries. Obtaining details of the inciting trauma is of utmost importance. The injury can be missed for sake of other serious injuries. Brucker P, Gruen G, Kaufmann R. Scapulothoracic dissociation: evaluation and management. Injury. 2005;36:1147–55. Damschen DD, Cogbill TH, Siegel MJ. Scapulothoracic Dissociation Caused by Blunt Trauma. J Trauma. 1997;42:537–40. Althausen PL, Finkemeier CG. Scapulothoracic Dissociation. Clin Orthop Relat Res. 2003;237:44. Zelle BA, Pape HC, Gerich TG, Garapati R, Ceylan B, Krettek C. Functional outcome following scapulothoracic dissociation. J Bone Joint Surg Am. 2004;86-A:2–8.